In clear view on the way up or down the first floor escalators of Concordia’s Hall building downtown are large hanging banners. The message: a call for the university to fully divest from fossil fuels now. This installation is one tactic employed by the student coalition Divest Concordia to pressure the university’s main investment fund—worth approximately $155 million—to rid itself of ties to the environmentally harmful industry. “We literally custom-tailor the portfolio to the clients for their own needs, wants and desires,” said Scott Benner, President and CEO of Nelson Capital, in an interview last year. Since then, a Joint Sustainable Investment Advisory Committee has been set up in order to monitor this investment and others, while providing recommendations on how CUF can best operate. The JSIAC comprises of CUF board members and university administrators as well as student constituents—including Lucinda Marshall-Kiparissis from the Concordia Student Union and Noelia Gravotta from Divest Concordia. Her main concern about the committee, she said, is that they will allow CUF to remain mostly unchanged because it’s easier to preserve the existing pools of money put towards research, bursaries, employee benefits and other university initiatives. The issue with this, she added, is that the environmentally destructive fossil fuel industry is unsustainable and liable to collapse in the near future. In Nelson Capital’s last report to the JSIAC, they reported a 3.92 per cent return from the $5 million investment, according to Bram Freedman, Vice-President of Advancement and External Relations at Concordia, and a board member of CUF. The return is higher than the benchmark they originally set, Freedman said. This report is not public but its availability, as well as transparency in general, will be a topic of discussion at JSIAC’s next meeting, he added. Despite this update and an annual report by CUF, there are still questions surrounding exactly where the foundation invests its money. CUF has an estimated ten per cent of its investments placed in the fossil fuel industry, which includes oils and pipelines, according to Freedman. This is difficult to know exactly, he said, because there are no detailed breakdowns of their investments. In order to figure this out, CUF would have to hire a specialized firm to contact all their different investment managers and compile a report, he added. Of the $5 million put into Nelson Capital, Freedman said it’s not known how much came from the estimated ten per cent of the CUF’s total fund, which is invested into fossil fuels. “We carved it out without calculating where it came from,” he said. When asked whether it’s an actual divestment, he said it wasn’t, adding that he’s not sure whether the university ever used the term. Today, Freedman said the student coalition’s goal of complete divestment from fossil fuels is made clear by Gravotta, the Divest representative at JSIAC meetings, but added that CUF is not there yet. Incorporated in 1991 and operational by 1996, the Concordia University Foundation is a not-for-profit organization and currently has 11 directors on its board. CUF is a private, separate entity from the university, but administrators like Freedman and Concordia President Alan Shepard sit on the board to help align the two. In CUF’s 2009-10 report, the breakdown was more specific, with categories like “oil and gas” and “pipelines.” The switch happened due to changes in Generally Accepted Accounting Principles and was not a conscious decision made by CUF, according to Freedman. GAAP is the model their accountants follow, he said, continuing that they can add more specific categories if they want on top of the more generalized “energy.” This will be part of the discussion of becoming more transparent at JSIAC’s next meeting, he added. CUF has not committed to accepting all the recommendations put forth from the JSIAC, according to Freedman. As well as monitoring investments by CUF, the committee also looks at investments by the Graduate Student Association and the Concordia Student Union, which has recently announced it’s own divestment campaign, worth approximately $6 million. 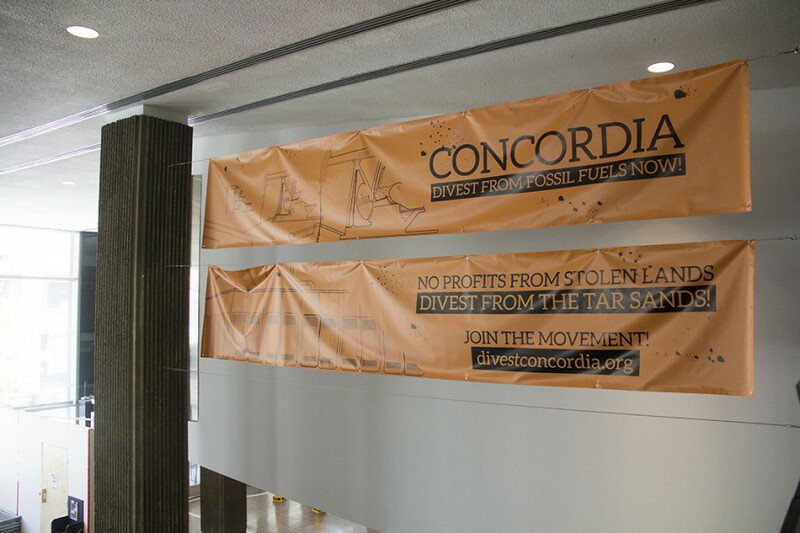 The banners in the Hall building form only one part of Divest Concordia’s campaign this year. A few weeks ago, the group held a general meeting to explain the harmful effects of the fossil fuel industry and discuss future mobilization. Jenna Cocullo, a Concordia graduate and member of Divest, led a PowerPoint presentation and subsequent discussion with about 20 participants. On Friday, Sept. 23, for the Concordia Shuffle—a charity walk between the downtown and Loyola campuses—members of Divest, including Cocullo, presented Concordia President Shepard with a document called, “Concordia’s Nine Directions for Divestment.” Pictures of the demonstration were posted to Divest Concordia’s Facebok page afterwards. It was a parody of the university’s Nine Strategic Directions to follow as guidelines for the coming years. None of the university’s directions are explicitly about divestment, and there also is no direction dedicated solely to sustainability. Shepard thanked them for the document and looked enthusiastic during the encounter, Cocullo said. For the upcoming academic year, she said there will be an “escalation of tactics” by Divest Concordia. Last semester, Divest McGill—a group Cocullo said they’re close to—occupied the office of McGill University’s Principle Suzanne Fortier. This form of protest may happen at Concordia too, as escalation of tactics could mean possible sit-ins, according to Cocullo.